« Buster’s Palace: Roof Is Go! Well, I’m glad I asked. Last week, something made me wonder where my bike-commute subsidy moola might be for the months of March/April and so I sent an email to the Howard Hughes Center’s transportation coordinator. Typically it arrives a month or so after logs are submitted, but here we were nearing the end of the second month and I got nothing. Good thing I got curious because the transportation coordinator told me I had not been forgotten and that a Visa gift card for my commutes along with a bonus card for riding my bike on May’s Bike To Work Week had been delivered more than a couple weeks ago. I asked around to the appropriate people in the office, but nope: nothing had been delivered along those lines for me. 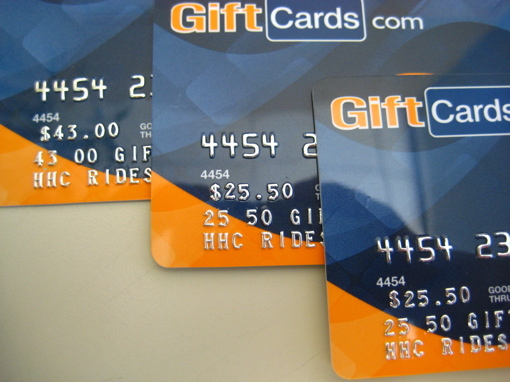 And hell, I just remembered I’ve still got $25 left on the gift card from my January/February commutes. This entry was posted on Monday, June 30th, 2008 at 7:13 pm and is filed under biking, money. You can follow any responses to this entry through the RSS 2.0 feed. Both comments and pings are currently closed.